Nashville is 17-0-3 when scoring at least three goals. 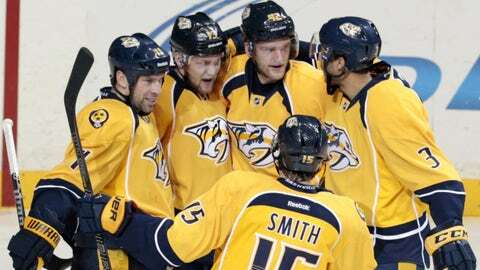 NASHVILLE, Tenn. — The Nashville Predators have been playing better recently, yet have only a couple of hard-fought points to show for their work. The effort paid off once they got back home. Mattias Ekholm’s first NHL goal proved to be the game winner as the Predators beat the San Jose Sharks 3-2 on Tuesday night for their first victory in four games. David Legwand had a goal and an assist, and Shea Weber added two assists for the Predators, who have earned points in five of six games. "It was good the guys got rewarded," Nashville coach Barry Trotz said. "We had a good game plan going in. We stayed with it and converted on a couple chances. Five-on-five I think we outscored them 3-1." Joe Pavelski and Patrick Marleau scored for San Jose, which has lost two of three. Nashville returned home from a trip in which the Predators lost all three games despite going to overtime twice. The Predators took control against the Sharks, scoring three goals in the second period. Nashville is undefeated in regulation this season when scoring at least three times. "Everything is so crucial right now," Nashville defenseman Kevin Klein said. "In our three prior games, we played really good games, but we lost two in overtime and one really close one. It’s one of those things where all of the points help right now. We’ve been playing a really good solid team game for the most part." The banged-up Sharks came into Nashville to wrap up their three-game trip, following a shootout win in Chicago on Sunday. The excitement of that win was tempered because forward Logan Couture is scheduled to undergo surgery on Wednesday for what is believed to be a hand injury. Sharks coach Todd McLellan said he didn’t think his club was good enough in its first game without Couture, and added that the leadership group has to step up, starting with the coaches and followed by the captain and assistants. "They have to be elite, and we weren’t at that level tonight," McLellan said. The Predators took a 1-0 lead when Legwand scored his seventh of the season with a wrist shot from the right circle at 3:35. Ekholm was called for his second delay of game penalty in two games when he put the puck over the glass. The Sharks took advantage to tie it when Pavelski tipped in a shot from Dan Boyle at 6:49. Ekholm made up for his penalty just 27 seconds later when he whirled and flipped the puck past goalie Antti Niemi to put Nashville back ahead 2-1. "It’s really nice to see him get his first goal and respond the way he did," Trotz said. McLellan called Nashville’s next goal a blown call by officials. Roman Josi, named to Switzerland’s Olympic team on Monday, scored with a wrist shot off an assist from Weber at 11:30. The puck found the net just after Predators forward Colin Wilson went down in the crease beside Niemi, blocking the goalie. But the goal stood for a 3-1 lead. "I understand mistakes because I make a lot of them behind the bench, but when you get an explanation from a group of people and it didn’t happen, it’s disappointing," McLellan said. "There is also protocol to follow in our league which is that you get together and you discuss it, and that didn’t happen, either." That goal wound up as the winner. San Jose outshot Nashville 11-5 in the third and got within 3-2 when Marleau tipped in a shot from in front past Marek Mazanec at 18:38. The Sharks then took their timeout with 44.5 seconds remaining but couldn’t force overtime. "You have to live with it," Pavelski said. "At the end of the day, that can’t bury us, but it did tonight."